1.3 What is anise used for? 1.4 WHAT ARE THE CONTRAINDICATIONS OF ANISE? 1.6 Is anise contraindicated for babies? 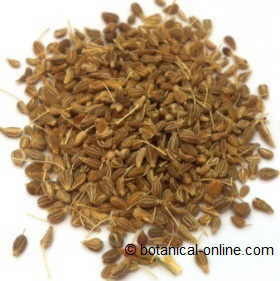 Anise (Pimpinella anisum) is a plant of Asian origin belonging to the Umbelliferae family. Its fruits are very aromatic because they are rich in anethole. Anise is consumed as food as an aromatic spice. Anise belongs to the same family of other plants such as cumin, caraway, fennel or celery. What is anise used for? WHAT ARE THE CONTRAINDICATIONS OF ANISE? – Endometriosis: Anise treatments is not suitable and must be avoided by women with endometriosis. – Breast cancer, uterine cancer or ovarian cancer: Women with breast cancer, uterine cancer or ovarian cancer should not take anise treatments for possible estrogenic effect. – Heavy menstrual cycles: Contraceptives and hormone treatments do not go well with anise if you have heavy menstrual cycles, if you take birth control pills, or if you are on hormone replacement therapy. Anethole has synergistic or potentiating effect on estrogen treatments, so it is not recommended to all those who take hormone medication. Is anise contraindicated for babies? The safe dose for a taby is unknown. Consequently, anise treatments in these stages are not recommended. Anise seeds as food can be taken very occasionaly. Use in children should be monitored for possible neurological effects. Check with your doctor in case of doubt. The essential oil should not be given to children without medical supervision. – Skin diseases: The plant contains bergapten, a substance that can cause photosensitivity. Anise treatments are contraindicated for people with skin diseases such as psoriasis, dermatitis or lupus. On the other hand, people taking anise treatments should not be exposed to sun. – Sensitivity to anethole: Anise should not be taken by people who already know their sensitivity to anethole. Anethole is a chemical component present in some essential plant oils, which is also found in star anise, fennel or basil essential oil. Anise is the most rich plant in anethole (90% of essential oil).